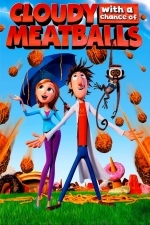 The Newbury Town Library will be showing Cloudy with a Chance of Meatballs (Rated PG). Popcorn and water provided. No registration required. When Flint lockwood's latest contraption accidentally destroys the town square and rockets up into the clouds, he thinks his inventing career is over. Then, something amazing happens as delicious cheeseburgers start raining from the sky. His machine actually works! But when people greedily ask for more and more food, the machine starts to run amok, unleashing spaghetti tornadoes and giant meatballs that threaten the world! Now it's up to Flint, with the help of weather girl Sam Sparks and Steve, his talking monkey assistant, to find some way to shut down the machine before the world is covered in super-sized meatballs!